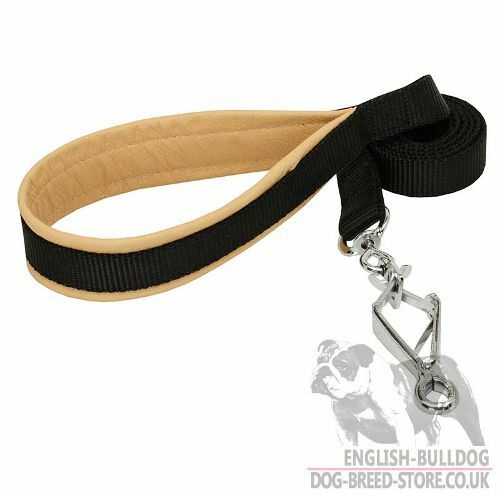 Nylon dog lead is our extra-strong dog leash for walking and training your strong English Bulldog or American Bulldog. 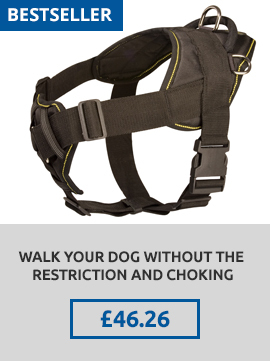 This nylon dog leash will help to make your daily dog walking more pleasant and convenient. 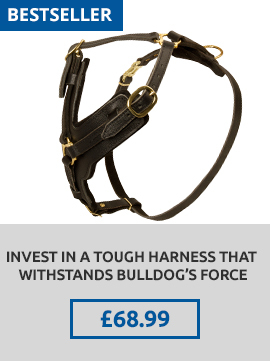 Be sure, this strong dog lead is indispensable dog outfit for Bulldog daily activities in any weather! This dog walking lead is made of durable water-resistant nylon, so you can walk your Bulldog in any weather with this nylon lead. 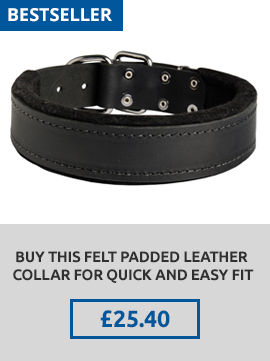 The nylon handle is padded with soft genuine leather inside for making the nylon leash even more comfortable. 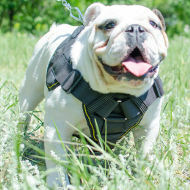 Nylon dog leash is equipped with Herm Sprenger quick-release snap hook with antirust cover, that`s why this extra strong dog lead will serve your Bulldog and you for long years. 1. Guy, another great product. The nylon leash is very well made and I just love the leather handle, very comfortable. Thanks again. See also our nylon dog leash with solid snap hook of brass. I have just got the parcel. Thank you very much! The products are of good quality, even better than I expected. I'm very glad! Now walks will be more pleasant!